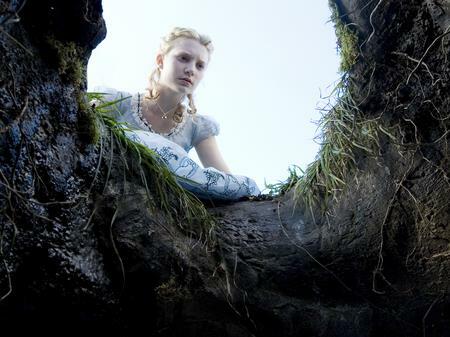 Alice, played by Mia Wasikowska, looking down the rabbit hole. The crowds gather in Leicester Square for the royal world premiere. Prince Charles and Camilla, the Duchess of Cornwall attend the premiere of Alice in Wonderland at the Odeon Leicester Square. A couple of Mad Hatters at the premiere. Singer/songwriter and actress Paloma Faith arrives at the premiere at the Odeon Leicester Square. Tim Burton, the director of Alice in Wonderland, is famous for his unique visual style. Actress Mia Wasikowska, who plays Alice, attends the royal world premiere at the Odeon Leicester Square. Actor Matt Lucas also attended the premiere. She didn't seem that happy with the weather. A very dapper Johnny Depp adjusts his glasses on a very rainy night in Leicester Square for the world premiere of Alice in Wonderland, in which he plays the Mad Hatter. Tim Burton, the director and Helena Bonham Carter, the Red Queen arrive at the premiere of Alice in Wonderland. Anne Hathaway stars as the White Queen.